Gas is cheaper. Where are the grandstanding pols? In most of the country, gasoline is now cheaper than milk. Oil prices are plunging. Gasoline is now cheaper than milk. Why doesn't Washington do something already? 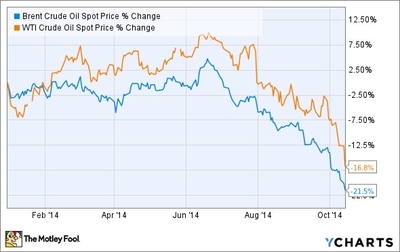 Since peaking in June, the price of oil has tumbled by 25 percent. Texas light sweet crude futures have fallen to around $77.40 a barrel, a three-year low, while Brent oil, the global benchmark, sank on Monday to its lowest price in four years. With cheaper oil has come cheaper gasoline. The national average price for a gallon of regular is now just $2.926. Drivers haven't seen pump prices this low since December 2010. Nor have they seen such a sustained decline  the price has dropped for 46 days in a row  since 2008. According to AAA, "the national average could fall another 5-15 cents in the coming weeks, which could make for the cheapest Thanksgiving gas in half a decade." Clearly the government needs to deal with this situation. What are Congress and the president waiting for? You're looking at me as if I'm crazy. Perhaps that's because you know that a drop of this magnitude in crude oil prices translates, as Michael Levi of the Council on Foreign Relations observes, "into more than $200 billion a year of savings for US consumers through lower prices for gasoline, diesel, jet fuel, and home heating oil." Perhaps you've seen the estimates that cheaper oil could boost America's GDP by 0.4 percent. Perhaps you know that shrinking fuel bills have been a godsend for transportation industries: Airline stocks, to cite the most dramatic example, have been on fire, and appear to be heading for their best back-to-back annual performance in 20 years. So only someone devoid of economic common sense would think of demanding that regulators or lawmakers "do something" about the shift in oil and gasoline prices, right? And yet when the price of crude oil or gasoline is rising, politicians and their enablers howl for blood. They vow to "crack down" on Big Oil, to investigate price "manipulation" by energy speculators, or to strip oil and gas companies of their tax credits. They freak out about the oil industry's "windfall profits." They haul energy CEOs before Congress. They accuse them of "price gouging." Oil prices, long steady at around $100 per barrel, have recently plunged to their lowest point in years. This past June, when crude oil was trading at $108 a barrel (about $12 more than it had fetched in January), Senator Bernie Sanders of Vermont and 17 Democratic cosponsors introduced legislation directing the Commodity Futures Trading Commission to deploy its emergency powers to "eliminate excessive speculation in energy markets." It wasn't the interplay of supply and demand that was pushing prices higher, Sanders claimed, it was greedy "big oil companies and Wall Street speculators." Less than five months later, with fuel prices at lows not seen in years, Sanders has lost interest in the subject, and now seeks other dragons to slay. But as University of Michigan economist Mark J. Perry points out, if the Sanders bill would make no sense now, it made no sense in June either  regardless of what oil was selling for on the futures and spot markets. If wicked "speculators" were to blame for the $12 per barrel increase in oil prices between January and June, Perry asked rhetorically on his bracing economics blog, shouldn't the same speculators get credit for the much bigger drop in oil prices between June and November? Or "are we to assume that greedy speculators only enter the futures markets when they 'smell profits' from rising oil prices, but then they suddenly disappear whenever prices are falling?" It should go without saying that traders can make  or lose  money both ways. (The Wall Street Journal reported recently on several hedge-fund managers who shrewdly read the tea leaves and profited by betting on a dive in oil futures.) It should also go without saying that the recent free-fall in the price of oil and gasoline is hardly an unmitigated blessing. It is causing no end of pain in great swaths of the economy  from the giant oil companies whose profits are being squeezed, to the small wildcatters who can't survive when crude drops too low, to auto dealers struggling to move hybrids and other fuel-efficient small cars. But grandstanding politicians would only make it worse. Market forces, not corporate villainy, explain why prices fluctuate. Thanks to America's fracking-driven oil surge, supplies of crude oil are unusually abundant; thanks to the economic slowdown overseas, global demand is unusually low. When rising supply meets falling demand, prices fall. As circumstances change, the pattern reverses. Volatility is normal. So no  government doesn't need to "do something" about fuel prices. When gas is $2.92 a gallon, the best energy policy is a free and robust economy. It's also the best policy at any other price.